This recipe is too good. I can’t remember the last time I ate about half a broccoli in one sitting. I saw enough broccoli and cauliflower growing up for a lifetime of good health and no longer feel the need to eat much of either, in their plain, steamed, circa 1960’s state, that is. In this recipe, the broccoli tastes pretty much like candy. And that’s with a whopping 1 tablespoon of maple syrup in the recipe. So, if there is someone in your life you’d like to impress, someone you want to feed well, so that s/he will love you even more than s/he already does, or if you just want to treat yourself, make this recipe now. I can’t wait to thank Jittery Cook fan Dorothy Salomon for passing on the original recipe, which has been tweaked to jittery standards. Make this now, then you will want to make it again and again. Separate broccoli into florets, and slice tender stalks 1/4-inch thin. Bring lightly salted water to a boil, blanch broccoli for 30 seconds, drain quickly, immerse in cold water, drain again and dry well. 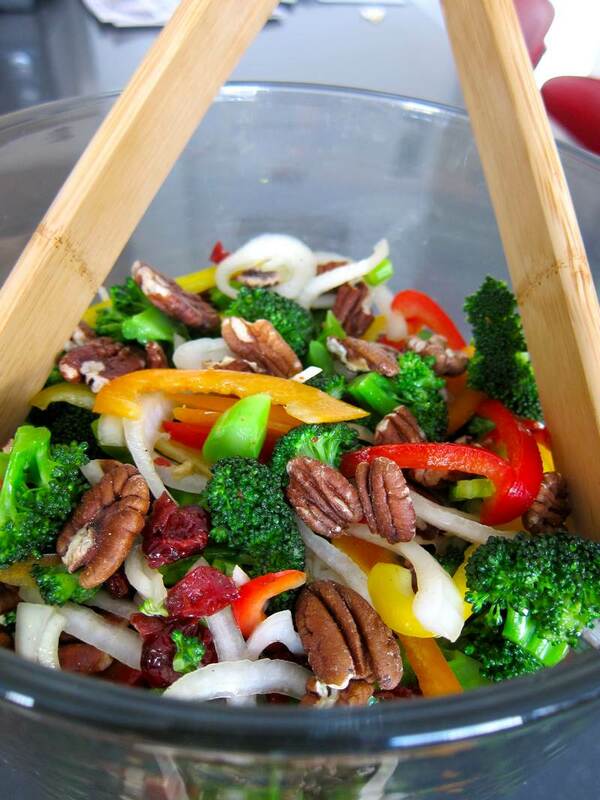 Combine broccoli, onion, bell pepper and cranberries with dressing, then refrigerate. Add the warm pasta, feta and pecans just before serving. In a small bowl, mix syrup and vinegar, soy sauce, garlic, ground pepper, mustard and red pepper flakes. Whisk in oil. 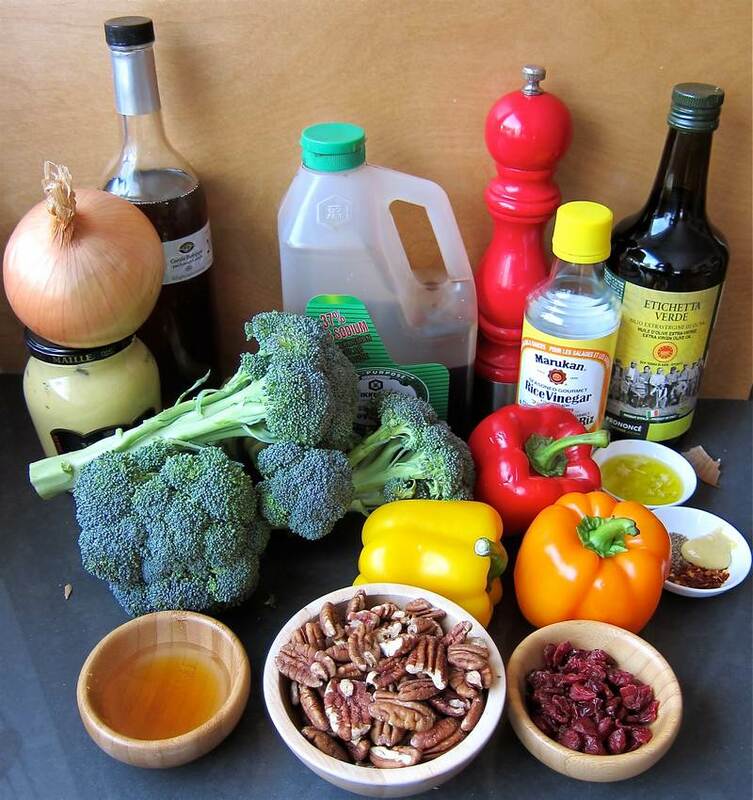 The Georgia Pecan Commission is responsible for the original version of this healthy and delicious Broccoli, Sweet Onion and Pecan recipe. Check out Hot Jittery Resources located at the top of the Jittery Cook blog. My eternal gratitude to Harriet Sugar Miller for proofreading and editing the Jittery Cook blog, sparing you from all kinds of glaring errors that somehow don’t reveal themselves to me. Toast extra pecans. They are perfect as a snack or to add to your breakfast cereal or yogurt. Thanks to my good friend Mimi Kitner for tasting and liking. There is nothing quite like a second opinion to make one less jittery. Apologies to the Super Bowl party group. I’ll work on that healthy dip recipe until it is blog worthy. Sometimes innovations just don’t pan out. « Bliss Balls – So Sweet for Valentine’s Day! Oh yummy, I think you should quit your day job (not that I think you aren’t dong a fantastic job) and just spend your time with this. I love the way you change recipes around and they are even better than the original one. If only the Jittery Cook blog would pay some bills–I’d love to blog full time. Thanks for liking my alterations again. I was thrilled with this recipe. I really do hope that everyone tries making it and that they love it as much as I do. Let me know if you have any more amazing recipes to share. I wish all the Jittery Cook followers would come forward with recipes that are just too good to keep to themselves. I can be the great recipe clearinghouse! It was as delicious as you described, and as pretty as the photos depict! Thanks for the wonderful lunch, company, conversation and a bird’s eye view of the Jittery Cook at work! I feel privileged to have been a “taster and a tester”! It helps that we share our food sensibility. Now where is that marinated goat cheese appetizer recipe from years ago? So colorful, it looks like a rainbow! Where are you getting those veggies? They look perfect! Thanks Jennifer. Look perfect and taste perfect. I swear this was one of the tastiest so far. I think the blanching helped the broccoli to look its best, and I cooked it the day after purchasing which helps for good looks and taste. This comment section is like having guests over for a cup of coffee or tea. Drop by any time. I know right? So much fun!! P.S. Your photos are stunning.